iPhone Call List to Computer Transfer - Transfer Call List, Music, Video from iPhone to Computer. 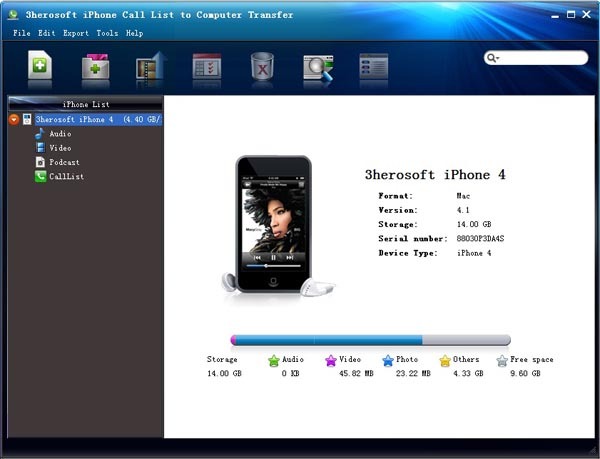 3herosoft iPhone Call List to Computer Transfer is the comprehensive iPhone files transfer software which can transfer Call List from iPhone to computer in TXT format files on your computer in case the important call lists are lost. Additionally, iPhone Call List to Computer Transfer can also let you add music and video to iPhone library and transfer purchased music, video and podcasts to local while upgrading iOS 5.0. And sync iPhone files to iTunes library. iPhone Call List Transfer can transfer music playlists to computer local or sync entire songs to iTunes library and backup iPhone music, video, podcast, etc. to local. Now this program keeps update with iOS 8 and supports iTunes 12. And it even supports all types of iPhone including iPhone 3, iPhone 4, iPhone 5, iPhone 5S/5C, iPhone 6/6 Plus, iPad and iPods, etc. iPhone Call List Transfer can transfer iPhone Call List as TXT files to computer for backup. Transfer Music, Video, Podcast, TV Show, Playlist, Call List from iPhone to computer for backup. Import music, video, podcast files to iPhone library, easier and faster than iTunes! Support all versions of iPhone including iPhone 3, iPhone 4, iPhone 5, iPhone 5S/5C, iPhone 6/6 Plus, iPod and iPad. You can open your iPhone 3, iPhone 4, iPhone 5, iPhone 5S/5C, iPhone 6/6 Plus with Explorer like an portable hard drive. With Filter and Quick Search option, you can find and select music, videos, call list files as quickly as possible, the same function as iTunes does. All iPhone info such as Type, Capacity (used and available space), Version, Serial Number, and Format. are fully displayed in the interface after you connect iPhone to Computer. How to transfer iPhone playlists to computer, sync with iTunes?